This excerpt is from an article in the Sentinel. Read the full article here. PHOTO BY SUZANNE POLLAK Celebrating their election victories Tuesday night were (from left) Council member Tom Hucker; Democratic candidates for State Delegate in District 20 Jheanelle Wilkins and Lorig Charkoudian; and District 20 State Sen. Will Smith. “Democrat County Council members Tom Hucker, Craig Rice, Nancy Navarro and Sidney Katz won their party’s support again and will be joined by Andrew Friedson on the Democratic ticket in November to represent their districts. Hucker celebrated his victory in District 5 over fellow Democrats Kevin Harris and Kenge Malikidogo-Fludd at Kaldi’s Social House in Silver Spring. Hucker was elected to the Council in 2014 after serving as a state delegate for almost 10 years. Proud of his efforts this term to help shrink class sizes in County schools and bring the Purple Line to fruition, Hucker said he planned more work on the same issues for his next term, if elected in November. 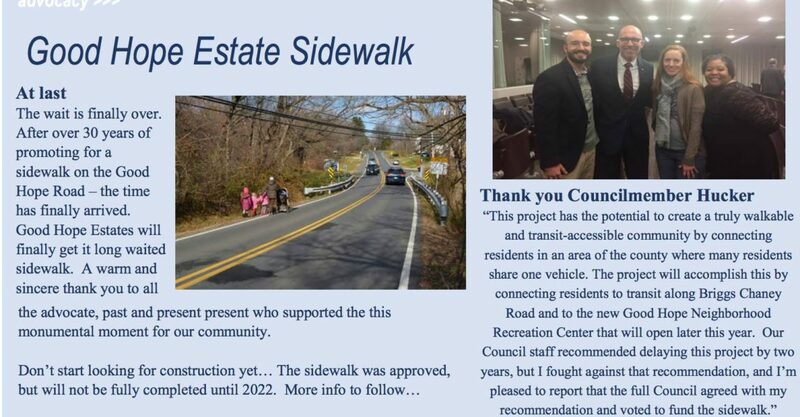 Claiming to have worked to bring the Purple Line to fruition “for at least 15 years,” Hucker said he will continue to make sure it gets done “on time and on budget” and with minimal impact to area businesses and homeowners. This information has been reposted from the County Council News site. For the original post, please click here. ROCKVILLE, Md., June 19, 2018 — With green jobs playing an ever-greater role in our economy, a steady supply of skilled workers is essential. 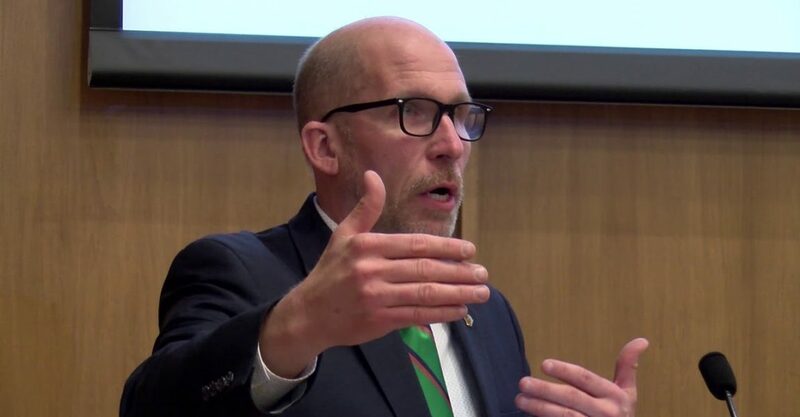 With that in mind, the Montgomery County Council on Tuesday approved a bill introduced by Councilmember Tom Hucker, who serves as the Council’s Lead for Environment on the Transportation, Infrastructure, Energy and Environment Committee, that will establish a clean energy apprenticeship readiness program within Worksource Montgomery. “This program will meet two critical needs in our County,” Hucker said. “It will help provide the skilled workers that our construction companies need, as the industry increasingly incorporates greener technologies. “And it will give our jobless and underemployed residents a great opportunity to train for a well-paying career and climb up the economic ladder, as the need for these workers will only continue to grow for years to come,” he said. On top of that, promoting more green building technologies is good for the environment and will help the County meet its goal of zero carbon emissions by 2035, Hucker added. The program will focus on training unemployed and underemployed youth and transitioning adults, including those leaving incarceration. The goal is to set them up for success in Maryland Apprenticeship Training Council-registered apprenticeship programs and eventual long-term employment in the clean-energy construction industry. The bill defines green jobs as those related to renewable energy, energy efficiency, energy storage, resource conservation, environmental protection and advanced transportation. “This is a great program,” said Council President Hans Riemer, a member of the Planning, Housing and Economic Development Committee, which voted 3-0 to support the proposal on June 11. Councilmember George Leventhal, another committee member, agreed with the need for the pre-apprenticeship program, saying SolarCity, a Tesla subsidiary, is “hiring like mad,” according to a relative who works there. The program is not expected to cost taxpayers anything, according to a fiscal analysis by the County’s Office of Management and Budget. The program is expected to cost from $10,000 to $17,500 annually, with Worksource Montgomery seeking grants or sponsorships to cover expenses, particularly from the State of Maryland’s EARN (Employment Advancement Right Now) program. “By demonstrating County Council and County Executive support for Green Jobs Apprenticeships, we will put Worksource Montgomery in a stronger position to win competitive grants from the Maryland Department of Labor to train the next generation of skilled workers,” said Hucker. At a public hearing last month, all four speakers — representing the Washington Suburban Sanitary Commission, CASA, the Sierra Club Montgomery County Group and Community Hub for Opportunities in Construction Employment, which works with 28 local building trades unions in the region — enthusiastically supported the proposal. “This is the right time for this innovative program, with significant development scheduled in the coming years in County buildings, schools, neighborhoods surrounding the Purple Line, downtown Wheaton and White Oak, all of which will have a significant focus on using renewable energy sources,” Hucker said. Silver Screens is back and bigger than ever! We’re excited to announce the return of our FREE outdoor film series at a new location! 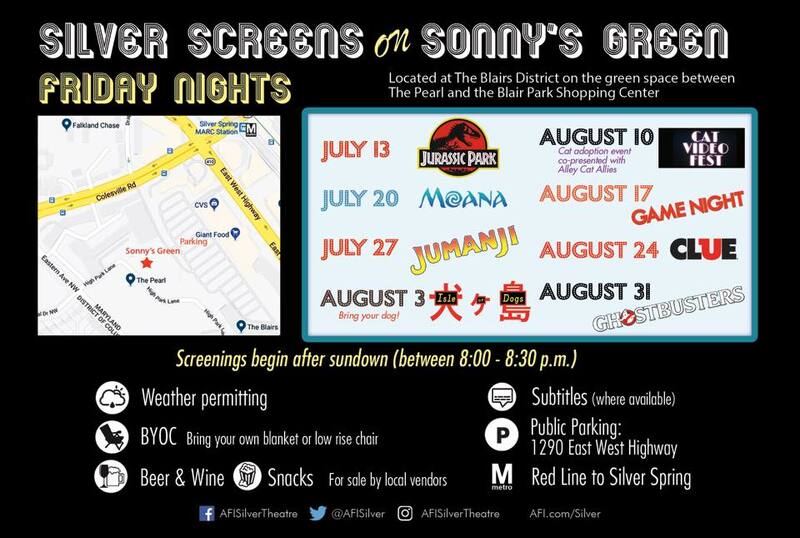 Join us each Friday, July 13 – Aug 31, on Sonny’s Green at The Blairs District for a season of big screen favorites under the stars! Films begin at sundown, between 8:00 and 8:30 p.m.
Councilmember Hucker’s office helped launch and secure funding for Silver Screens 2 years ago with the AFI Silver Theatre and Cultural Center. 2018 Silver Screens is co-presented by AFI Silver Theatre and Cultural Center, The Blairs and Montgomery County Councilmember Tom Hucker. Sonny’s Green is located at The Blairs District in the center of the property and is accessible from High Park Lane or The Blairs Shopping Center (1290 East West Highway) parking lot. If you are traveling by car, free parking is available at the Public Parking Lot located at 1317 East West Highway. From the lot exit to your right and walk to the traffic light and cross to The Blairs Shopping Center. The entrance to the park is located at the back of the Giant parking lot. While holding the line on taxes and starting to reduce our borrowing, we’re fully funding the school board’s operating budget request. We’re adding $237 million for additions and renovations at 10 schools in District 5, including $123 million for Northwood High. We’re maintaining staffing at Hillandale Fire Station 24 and the Burtonsville station. We’re adding a detective to the vice unit to combat human trafficking. We’re devoting more resources — $27 million — to curb gang violence, with stronger efforts from the courts, police and community intervention programs. We’ve slotted $5.7 million for a long-overdue overhaul of Hillandale Local Park. At the Forest Glen Metro station, we’ve allotted $15 million for a second entrance and pedestrian tunnel under Georgia Avenue. There’s money for new Bus Rapid Transit projects on U.S. 29 and New Hampshire Avenue. And we’re moving ahead with studies for a new student loan finance program, which can make Montgomery County a national leader in helping borrowers refinance their crushing debt loads. My thanks to my Council colleagues and our staff for their hard work in hammering out a budget that both meets our county’s needs and is fiscally responsible. The wait is finally over. After over 30 years of waiting for a sidewalk on Good Hope Road – the time has finally arrived. Good Hope Estates will finally get its long-awaited sidewalk. A warm and sincere thank you to all the advocates, past and present who supported this monumental moment for our community.